KATHMANDU, April 6: When he took office in January, Chief Justice Cholendra Shumsher JB Rana had set out three main priorities for his four-year tenure; ensuring good governance, reaffirming the independence of the judiciary and restoring the judicial credibility. Despite his questionable career, Rana’s vision for the judiciary and his resoluteness to restore judicial credibility was received amid high optimism. Even his fiercest critics had given him the benefit of the doubt. For an institution beleaguered with opaqueness, rampant corruption and lack of political will, Rana’s tenure did start off on a high note. Just days after assuming the office, Rana transferred five Biratnagar High Court judges to the Judicial Council for possible misjustice. He also ordered the courts to close doors to middlemen. His landmark order on Ncell tax evasion scam raised hopes of good governance. Four months on, Rana, despite some success in promoting good governance, appears to be failing in other areas, especially reaffirming the independence of the judiciary and restoring the judicial credibility. Political interference and intervention by various interest groups in the judiciary were laid bare earlier this week when the Judicial Council recommended known cadres of political parties for judges positions. On Tuesday, the Judicial Council had recommended three lawyers and two career judges for appointment as Supreme Court justices and 18 others for appointment as high court judges. Among the recommended to the post of SC justice include a cadre of the ruling Nepal Communist Party, a leader of the main opposition party, and a nephew of former chief justice. The recommended list has drawn widespread criticism from within and outside the judiciary. Even some leaders from within the political parties have expressed dissatisfaction over the recommended names. “He (Rana) picked almost everyone from whom he was supposed to save the judiciary. This is a total capture of the judiciary by interest groups -- from big businesses to middlemen to political leaders. Now judiciary is beyond redemption,” said Om Prakash Aryal. Aryal opined that CJ Rana, despite his big talks, appears bent on destroying the credibility of the judiciary by converting the courts into recruitment centres for the agents of various interest groups. “He has ensured that judiciary remains in the clutches of agents for decades to come. Some of those recommended faces would be in court for 18 years. This is going to be detrimental and will ultimately destroy the judiciary. My worst fear is these people might be used to witch-hunt and prosecute dissidents,’’ said Aryal. Despite clear provision for separation of power in the constitution, the judiciary has long faced blatant interference from the government. In 2017, then Prime Minister Sher Bahadur Deuba had brought an impeachment motion against Sushila Karki. 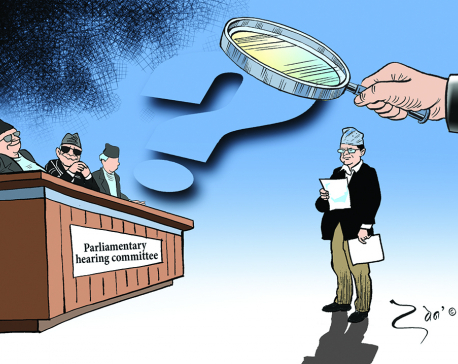 After Oli came to power in February last year, the Judicial Council sacked the then chief justice Gopal Parajuli citing incongruity in date of birth. Most of justices and judges appointed since 2008 were nominated under political quota. During Jhala Nath Khanal’s term as prime minister, several justices had paid homage to the prime minister after taking their oath of office. Aryal, however, said Rana had lowered the bar by allowing everyone to enter the judiciary. “His predecessors, at least most of them, used to make sure that seniority is respected and sanctity of the court maintained. But this is no longer the case,” said Aryal. Aryal is one of the many senior advocates to criticize the newly-recommended justices for the apex court and the high court. A day after the JC proposed the names, senior advocates including Sambhu Thapa and Harihar Dahal among others had boycotted a nationwide conference of justices citing blatant attack on the independence of the judiciary. They have accused Rana of promoting nepotism and favouritism in the selection of justices. “The judiciary doesn’t look like judiciary anymore. Things cannot get further worse. This is a new low,” said Thapa. Five names recommended for the SC posts include high court judges Prakash Dhungana and Sushmalata Mathema, senior advocate Hari Phuyal, Kumar Regmi and Dr Manoj Kumar Sharma. Dhungana and Mathema currently serve as the chief judge in Patan high court and Surkhet high court respectively. Phuyal, considered close to the ruling Communist Party Nepal, served as attorney general in the then UML government led by prime minister KP Oli in 2016. Regmi is a senior advocate at the SC, while Sharma is a relative of former chief justice Damodar Sharma.